Shutterfly.com is the king of photo gifts, but when SnapBoxPrints asked us to try out their new photo pillows, we let them go head to head with Shutterfly, ordering one pillow from each as a surprise present for Joy’s niece who has a one-year old daughter. 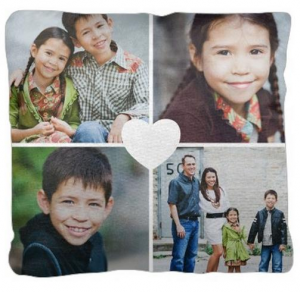 SnapBoxPrints gives you an 18 inch by 18 inch photo pillow for $35. At Shutterfly, we spent $40, and the pillow is smaller, at 16 by 12. But we’ve never been there when they weren’t having a sale. Both sites have pillow templates, though Shutterfly had a few more to choose from. At Shutterfly, we chose a pillow with slots for four photos of our niece’s baby, and the word “Love” scrawled in the corner. At SnapboxPrints, the one we liked best was a single photo with some scribbled hearts in one corner. SnapboxPrints also has peel-and-stick fabric posters starting at 75 cents. SnapboxPrints warned us that the photo we downloaded from Facebook was too low quality, so we asked our niece to send a higher-resolution version. We got no such warning from Shutterfly, but both services produced great results. It comes down to which templates you like best, though the fabric used by SnapBoxPrints was nice and velvety. For photo books, we like Mixbook.com. It gives you 50 percent off on your first order, and is easy to use.